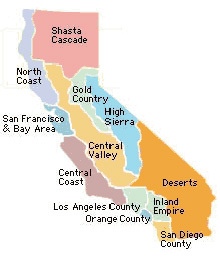 The Inland Empire is "in-land" to Los Angeles County, Orange County and San Diego County, and is bordered on the east by the Deserts Region. It's a rural area with mountains, farmlands, orchards and vineyards that's larger than the states of Rhode Island, Connecticut and Delaware combined. Outdoor enthusiasts will find much to keep them busy in this region: Boating, fishing and water sports at Big Bear Lake and Lake Arrowhead; Skiing in the Jaqunito Mountains; and Exploring in the San Bernardino National Forest.